Measures: Height: 4", Width 5". Dimensions are 9" x 5". Will go great in any or all the bathrooms in the house. Measures: Height: 7", Width 8". 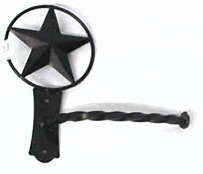 Key holder with scrolling star. Holds 4 Sets of Keys. 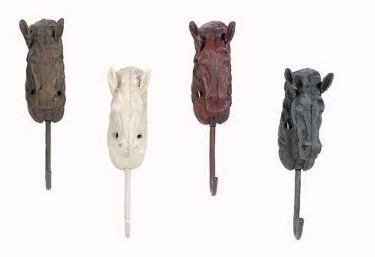 Vintage-art horse heads crafted from solid cast iron and fitted with useful hooks. Perfect for use in the hallway, kitchen or bath. Measures: 8½" tall, 2" wide and 3" from the wall to the nose. *Please choose color BEFORE you order! Lovely way to hold your shelves up. 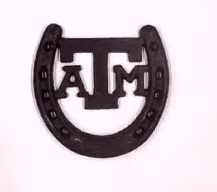 Has a Texas Star theme. 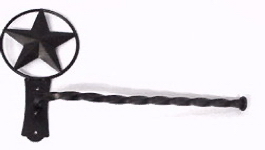 Wrought Iron Star Door Handle. 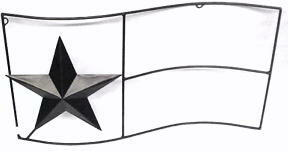 Show your love for Texas with this Texas Star mailbox decor. Has one hole in either end of base for easy attachemnt. 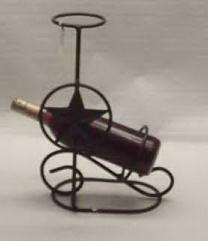 Bring some Texas flare to those quiet evenings in with our wrought iron wine holder. Holds one bottle, has a Texas star and a candle holder. This cast iron giraffe paper towel holder is a unique and functional decor piece that is perfect for the kitchen of any giraffe lover. Just slide a roll of paper towels down the giraffe's neck. His protruding head with keep the roll in place, and the weight of the cast iron will let you pull one paper towel at a time. It measures 17 3/8"T x 4 1/4"L x 3"W. It has an aged verdigris green and black painted finish that goes with most kitchen decor. It makes a great gift. 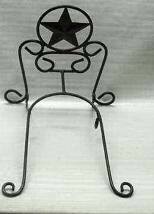 Beautiful wrought iron paper two piece paper towel holder. 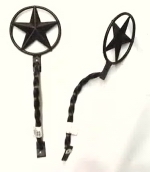 Has removable top piece with a Texas star. Its demensions are 8" x 6 1/2". 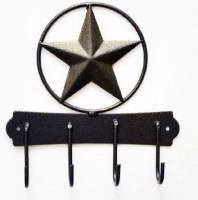 Add good old Texas style to your kitchen. 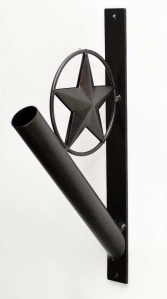 Wallmounted paper towel holder, mounts with minimal hardware (not included).It has a powder coated brown finish. With star accent. 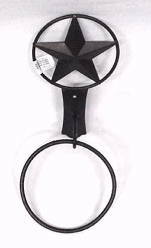 Grace your bathroom with this cute toilet paper holder with a star accent, has a powder coated brown finish. 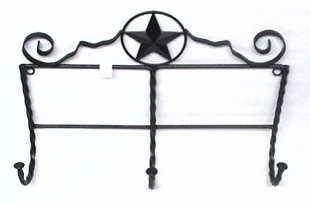 Wrought Iron Hat Rack with horse shoe with a star in the middle. Keep your favorite hats from getting damaged hang them on the hat rack. Set up family photos or your little ones pictures on this beautiful hand crafted wrought iron easel. 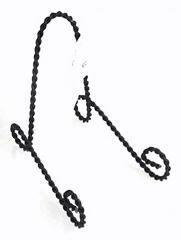 Its dimensions are 16" x 8 1/2" x 8"
This Sun Calendar Hook is perfect for dressing up your calendar. 12 gauge black wire with a heart in center, above a single hook. Holds one standard sized calendar. The Heart Calendar Hook is perfect for dressing up your calendar. 12 gauge black wire with a heart in center, above a single hook. Holds one standard sized calendar. 14" long and 4" wide. 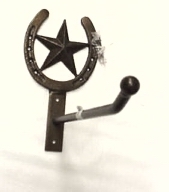 This Horseshoe Calendar Hook is perfect for dressing up your calendar. 12 gauge black wire with a heart in center, above a single hook. Holds one standard sized calendar. 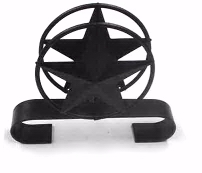 This plate holder is made of twisted metal for just the right accent to any plate to display. Has a pewter color to it, you can always add your own touch of color to match your decor by spray painting. Will hold a small size plate. This plate holder is made of metal. Has a pewter color to it, you can always add your own touch of color to match your decor by spray painting. Will hold a small size plate. Measures 4" tall. 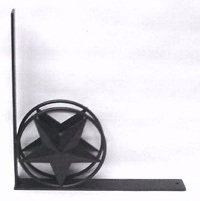 This plate holder is made of twisted metal for just the right accent to any plate to display. Has a pewter color to it, you can always add your own touch of color to match your decor by spray painting. Will hold a regular size plate. They say first impressions are important! 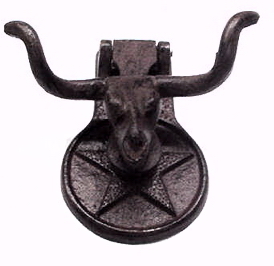 So greet your guests at the door with this Steer Head door knocker. Add that southern style to any door. Rustic brown finish. 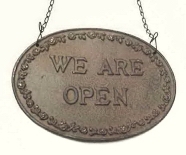 Measures:5 3/4"T x 3 5/8" W.
Measures: 13 3/4" long x 1 1/2" wide and the flag pole tube that extends from the bracket is 10" deep and has a 1 1/16" inside diameter. Use in flower beds or small garden. You can make a statement all year round with creativity, flair and style. 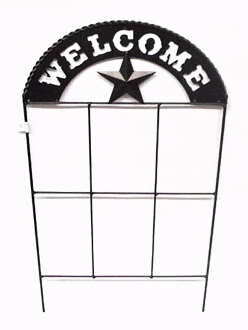 This 3 Hook wrought iron coat rack makes a simple and convient place to hang coats near a entryway. It has a powder coated brown finish.